Birds, Ballads and Billabongs: Australia’s Wild West! It’s hardly surprising, given the lyrics of Aussie folk ballad Waltzing Matilda* are responsible for most people’s entire knowledge of billabongs**, that to visit a real one raises certain expectations. So the unexpected dearth of swagmen, coolibah trees, jolly jumbucks and troopers at the Marlgu Billabong, oasis in the Kimberley west of Kununurra, was a staggering disappointment. BUT … at least we didn’t have to wait long to find out why! Bizarrely, while technically accurate, the two-sentence teaser from the Glove Box Guide to the East Kimberley didn’t fully capture the essence of Marlgu Billabong or prepare us for its many attractions. A boardwalk and shaded bird hide have been constructed over a billabong within the Parry Lagoon Nature Reserve. A birdwatcher’s paradise. Although that would – and did – capture a twitcher’s attention, it probably wasn’t quite enough to reel in the crowds this unexpected jewel-like Outback oasis deserves. And the roads in weren’t doing it any favours either. But then, it’s probably just as well. 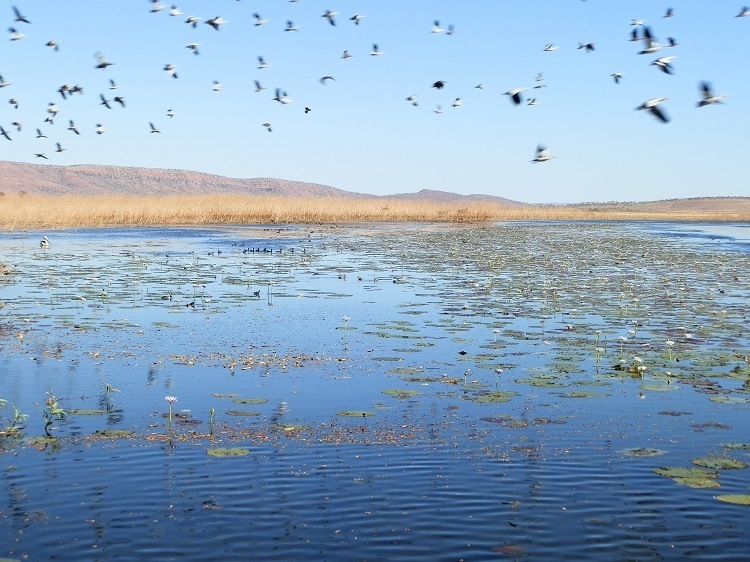 Massive crowds at Marlgu – an Aboriginal word meaning ‘wild bird’ – Billabong would almost certainly affect the quality of an experience dependent on listening, observing and patience. But bigger crowds would significantly enhance my own secret indulgence – people watching! And watching the visitors who think Marlgu Billabong is an amusement park with performing animals just waiting for their pix to be uploaded onto a random strangers FaceBook page are funniest of all. Because the creatures who frequent this remote and sometimes inaccessible spot are wild, unpredictable and – oddly – don’t seem to have the tourist experience at the top of their agenda! But a quiet observer is usually rewarded … and although it’s possible to come here and NOT see anything, that didn’t happen to us! 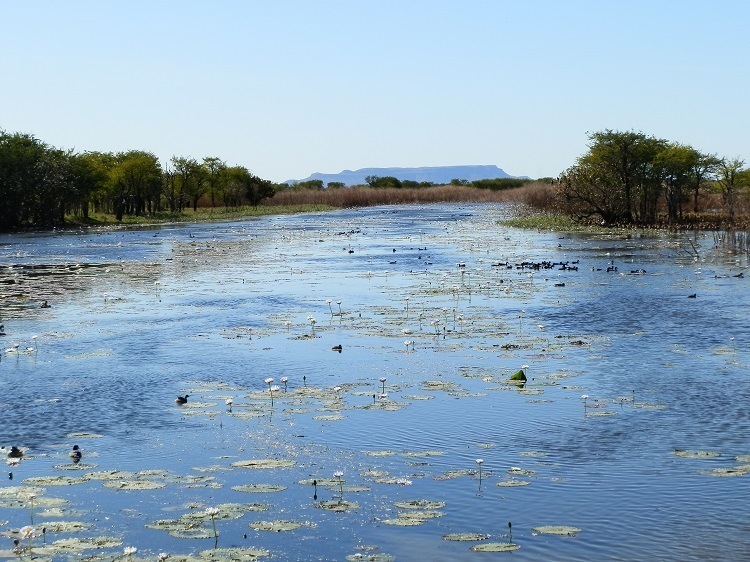 On the alternative back route (read ‘rough 4WD track’) from Kununurra to Wyndham, the Parry Lagoon Nature Reserve of which Marlgu Billabong is a part, is a RAMSAR*** wetland of international significance as it’s on the shorebird migration route. Although shorebirds are the last thing you’d expect to see after driving through the magnificently dry and arid East Kimberley landscape en route to the Billabong. The parched dry season landscape doesn’t look as if it’s EVER been wet, let alone wet enough to support a large and thriving permanent waterhole. None of the 60+ bird species we observed on our two July 2012 visits (totalling 3-4 hours) seemed overly concerned by the ever-present – and quite large – crocodiles that delighted the random selection of tourists who actually saw them. Maybe because the big crocs rarely bother with such small prey – the energy burned by catching them is far greater than the small amount replaced by eating them! Killer photographs aside, witnessing direct interaction between the crocodiles and the bird life would have been a bit ghoulish – so thankfully, despite the aggression imbalance, the scene remained peaceful and serene. Our caravan park neighbour also seemed happy enough not to be involved in a direct human/croc interaction, albeit for different reasons. Upon hearing he was to travel northern Australia in a campervan, his Swiss friends were apparently convinced he’d fall victim to a crocodile attack. I’m sure the car hire companies would be intrigued by footage of the random selection of vehicles jolting down the rough, rocky track to the waterhole from the old Telegraph Station on – yes, you guessed right: Telegraph Hill – overlooking the Billabong. But inadvertent entertainment aside, they were only a brief distraction from the main attraction – starting with the pair of Brolga in the carpark, the massive selection of ducks in the shallow waters surrounding the main pool, the astonishing array of birdlife on the billabong itself, and – of course – the crocodiles! … and also turns the Waltzing Matilda fantasy tableau – a swagman boiling his billy while camped beside the Billabong with a freshly killed sheep ready to roast – into Waterhole Massacre. But with all the crocodile, tourist and other wildlife action, who cares? « 1000 Words About … Pedestrians Crossing! 6 ALMOST Secret TOP Australian National Parks! 12 HOT Aussie Sunsets … and a Sunrise! Thank you Tasha! I want to go BACK so badly!! One visit isn’t enough! Maybe I’ll see you there one day??!! A hidden gem. One of the beautiful places that tour buses don’t get to. @Meftun Tenkeci – Size selamlar benim de arkadaşım! I think I would enjoy a visit to this beautiful area without a lot of tourists around. I wouldn’t be wildly excited about the crocodiles, but I guess we can’t have everything. Your photos are marvelous. @PDP – Haha, nothing’s too good for you, right?!?! And you’re right about the croc I suspect! @Jo – I had the benefit of as much time as I wanted there! I think tours like yours as a great way to find the places you want to revisit!! It’s amazing what a difference no pressure makes! @George – Yeah, it’s easier to see the birds with less people! At least the croc was behind a barrier which NO ONE was going to jump over!!! @Linda – It’s even better live!! Try it sometime! @Arija – I don’t have enough birdo followers to put a full bird list, but 60+ varieties without really trying too hard makes it a TOP birding spot! As well as scenic!! @MJWC – It’s like they didn’t even care he was there!! @Jill – HAha, if the world’s biggest technophobe (ie ME) can insert a video, it can’t be that hard!!! 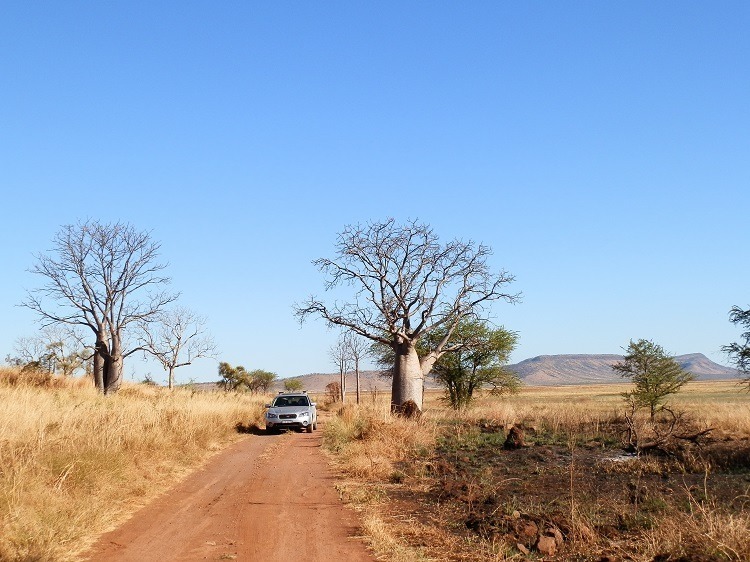 And Marlgu is SO on the list for our next Kimberley trip! @Alessandra – You see? SO many good reasons NOT to be taken by a croc! It’s easy to stay safe – just obey the signs and stay behind the barriers! LOTS of us have survived a croc-sighting!! @Rose – Haha, I think he may have already eaten his fill!!! @River – I believe you’re right – there wasn’t a lot of info about the building specifics, so I don’t know what happened to the old one. Possibly fire, hurricane or some other nasty tropical weather event!!! @Filip – I believe this habitat is very similar to the Everglades, although not quite so extensive! But our crocodiles are bigger! @SFlaGuy – HAha, you don’t mean ‘English’, you mean ‘American’, don’t you?!?! Completely forgot to translate ‘swagman’ … good thing you’re on the ball!! @Kath – It’s a far cry from the Alhambra … but it’s still pretty good! Your father has good taste!! @Sallie – Thank god I don’t have to translate EVERYTHING!!!! Maybe I should put an ‘OZ/rest of the English speaking world’ dictionary on my site somewhere?!! @Andrew – I’m happy to say I haven’t seen that happen!! But I’m not surprised the bird disappeared – even the small crocs have big mouths! @LONDONLULU – Haha, that brand is BIG down here too!! Funnily, I wasn’t thinking of it at all when I was actually AT the billabong! In Wyndham at the tourist info they gave me Tea-Tree-Oil for free cause I was so dang bitten by sandflies… See. Even that (being bitten badly) now has kinda sweet memories. And you brought them back. Great pics. But, uhhh, that croc freaks me out (memory: Darwin). 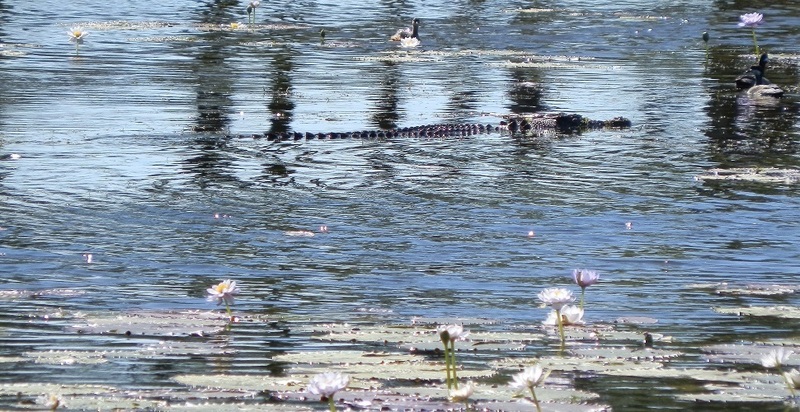 The Crocodile at Marlgu Billabong, looks huge!! I was very surprised to see all the birds staying so close to that croc. What a lovely place. Thank you so much for this wonderful tour! Just my kind of place, especially with all that water, geese and brolgas. Looks like it’s going to the top of my bucket list. This sure looks a wild and pristine area. With a road like that any wonder tourists dont flock there and maybe thats a good thing. We have a few resident Magpie Geese on our local lake. I think they flew here from up north and decided to stay. Great shots especially of the crocodiles. They are scary beasties. I am most impressed with the trees in 4th photo – never saw trunks like that before. The telegraph station is really quite interesting – looks like a foothold to build a cottage. The crocs with the birds I love – waiting patiently for a bigger meal. Great shots Red. I love your writing Red, and your descriptions and images of Marlgu have transported me right back to our visit a few years ago. What a thoroughly beautiful and captivating place. We visited on the way from Broome to Wyndham, and again on the return trip. Beautiful beautiful. There was a resident croc when we visited too. I love the way you have inserted video and sound. I am going to have to find out how to do that! Thanks again for a thoroughly entertaining piece. It’s an oasis and a fabulous and unexpected birding spot! The comment above is funny…. I actually knew what all those “foreign” words mean…been reading you for a while! And you are not only a good people watcher, but also a good people listener..the crocodile story about the tourist in the camper is priceless. It’s a very pretty billabong and I’d like to see it one day. I’m curious about the old telegraph station, are those stumps the old foundations upon which the house sat? They certainly look like you could just put down some floorboards, raise the walls and add a roof. Oh yes, I would love to hang out in the hide there. Isn’t that shot of the croc with the birds just A-mazing?! Ha, the word Billabong always makes me reminisce about home in surfer world Hawaii (one of the most popular brands of apparel!) Anyway, thanks for that little memory job and these utterly gorgeous vistas! 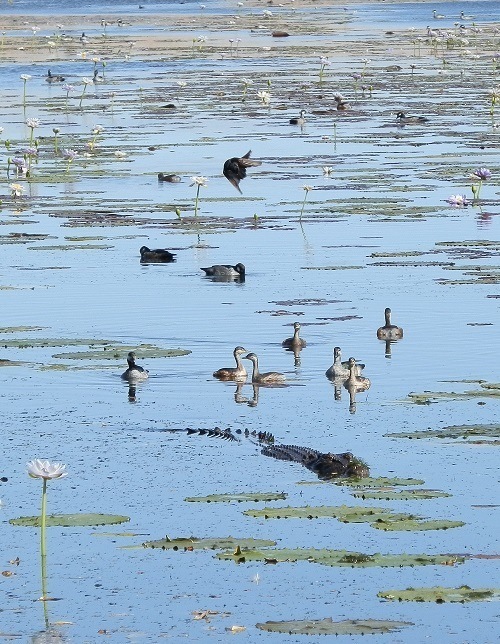 Wow, to see those ducks swimming there with the crocodiles seem so strange and bizarre, and all those lily flowers, so beautiful… I am so scared of crocs, but have to admit that watching the video they do swim gracefully. Amazing vistas! But I have to say “No thanks” to encountering a croc. Your photos are smahing, Red. My father – a keen twitcher – has been there and raved about the place. Now I understand why. Great variety of birds, reminds me a bit of the Everglades in Florida. The kind of tour I would love to take! Great post. Are those Baobab trees on the 4th shot? I thought they existed in Africa only. I saw a croc take a bird in the NT. A quick snap, and the bird was gone.